Brilliant Earth Reviews: Do they Justify the Premium? To be completely honest and up front, we set out to write this review positively. We really wanted to find a way to work with Brilliant Earth. They even offered us a higher commission rate than our other affiliates. But when it came down to it, we just couldn’t find an avenue that was a true value added service that was worth the premium. Let me start by saying that I am very passionate about ethical consumption. I only buy free trade coffee and other food products, I purchase 90% of my food from local food suppliers I volunteered at the local food co-op. I also buy my clothing from companies that have documented fair treatment of workers. I strongly believe that we, as consumers, have a responsibility to make moral choices about the impact our purchases make. That said, no one (at least no one that has gotten to the point where they are searching online for a diamond) lives completely off the grid. I, like everyone else, make a decision (actively or subconsciously) whether something adds enough value to our life to balance any negative impacts it may have. This is a personal choice every person must make and I am not here to decide what is right or wrong for other people. What I can do for you is peel back the layers of marketing propaganda and let you make the choice based on reality instead of some salesman gimmickry. So that brings us to Brilliant Earth. First we will look at their claims of being the “ethical choice.” After that, we will do an analysis of the value and quality of their diamonds. Brilliant Earth’s unique value proposition is their “Beyond Conflict Free” guarantee. They claim that their diamonds adhere to 5 important standards: their diamonds are not used to finance civil wars (conflict diamonds), they are free of human rights abuses, they are environmentally responsible, they are mined using fair labor practices and finally the mining activities that produce their diamonds are involved in community development. They claim that the Kimberly Process only serves to keep conflict diamonds out of the market, but does nothing to influence the other 4 standards in their guarantee. What follows is an examination of these 5 categories. When Brilliant Earth markets diamonds as “Botswana Sort” what they are referring to are diamonds sold by the De Beers partnership with the Botswana government called Debswana. Debswana is the largest private sector employer in Botswana, providing a robust livelihood to over 5,000 locals. De Beers sightholders purchasing this rough are required to invest heavily in local infrastructure and must polish the rough diamonds locally to provide additional employment to the local economy. To say that the Debswana partnership has been a boon for the citizens of Botswana would be a drastic understatement. Diamonds account for a full 1/3rd of the nations GDP. Botswana has the healthiest credit rating of any African nation. The question begs itself – if African diamonds do so much good for the locals, then what is the problem with buying diamonds on the broader market? To answer this question, we need to delve a little deeper into the process of diamond mining itself. There are essentially two methods of mining diamonds. Diamonds can either be mined in deep earth mining operations (whether underground or in an giant open pit) or in alluvial mines. Alluvial mining refers to extracting diamonds from river beds. While all deep earth mining, and most alluvial mining (by carats mined), are totally fine from an ethical standpoint since they are operated by large corporations that are gravely concerned about their reputations, there is still a minority that comes from small “artisanal” mining operations. These are essentially disorganized, local mining operations where miners don’t have access to proper markets to get the full value of their finds. Likewise, children are often found working at such mines. It is estimated that these disorganized small-scale alluvial mining operations account for around 15% of African’s mining output. Thankfully, there are amazing organizations such as the Diamond Development Initiative that help to organize these miners and provide basic services for them. Brilliant Earth deserves much credit for donating 5% of their profits to organizations such as the DDI. To summarize, Brilliant Earth’s claim is that if you buy a diamond from a regular vendor that hasn’t had their diamonds’ origin traced, there’s a chance (roughly 15%) that you might be buying a diamond that was mined in an artisanal mine, which might be tainted by a human rights infraction. 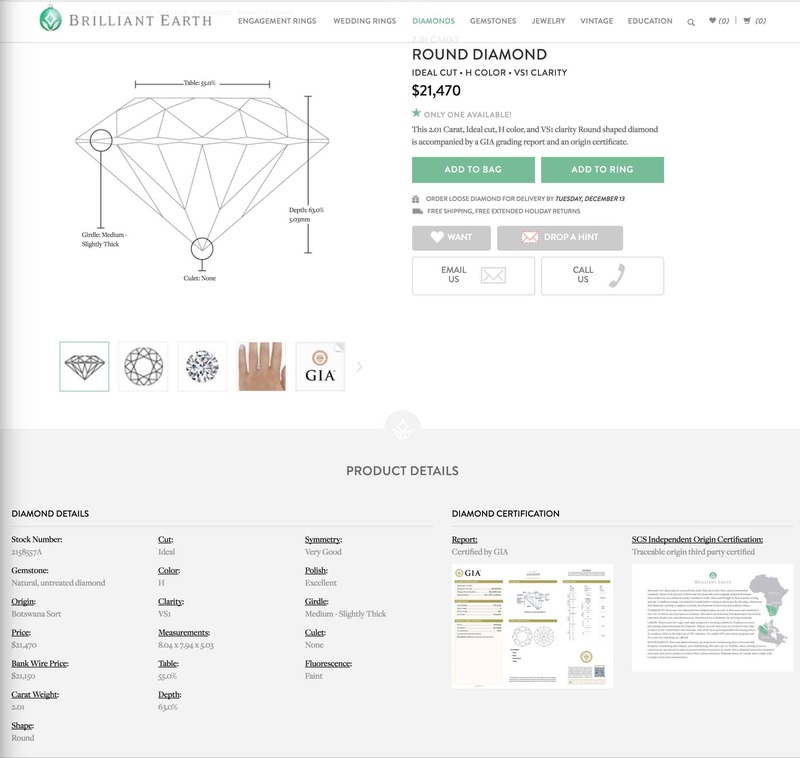 Buying a “Botswana Sort” diamond, says Brilliant Earth, not only removes that concern, but also helps sustain the solution – responsible diamond mining offering significant benefits to the local population. That is an extremely powerful value proposition. Lets examine it a little more closely. 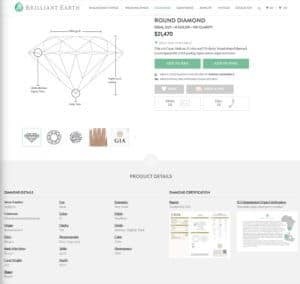 First of all, how does Brilliant Earth guarantee that the diamonds they claim are from a Botswana sight do actually come from there? They don’t have paid inspectors constantly overseeing their supplier’s inventories. Brilliant Earth’s suppliers are all companies that operate just like my former employer, Leo Schachter. 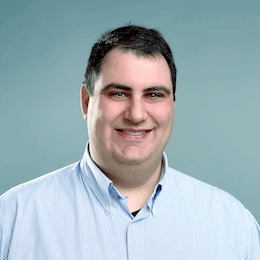 Leo Schachter does have a Debswana sight, but they also buy rough diamonds from other sources. They claim they audit their suppliers, and while I’m sure that’s true, it’s unclear as to the extent of these audits, and by their very nature, audits are static events in time – they do not represent the reality of the ongoing functioning of the businesses in question. Furthermore, are these audits announced or unannounced? Fundamentally, Brilliant Earth must rely on the honesty of its suppliers to uphold their agreements that they will only list diamonds on Brilliant Earth that conform to their standards of provenance. Can these companies be trusted? Lets take a look at a revealing example. 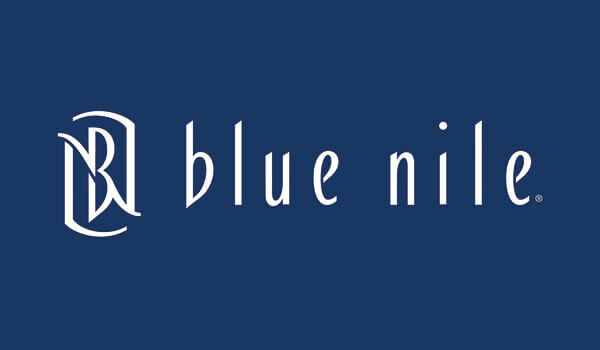 As you might know, Brilliant Earth and Blue Nile are stores that require that their suppliers sign exclusivity contracts with them. What this means is that in order to become a Blue Nile vendor, a diamond supplier needs to sign a contract that any diamond listed on Blue Nile will not be listed elsewhere. The same is true for Brilliant Earth. Below are screenshots taken on 12/6/2016. They are of the same diamond listed on both Blue Nile and Brilliant Earth. Now of course, this on its own is really not a big deal. 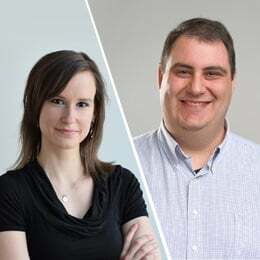 When a company is managing an inventory of many thousands of individually cataloged diamonds, it’s easy to understand how a mistake can slip through. But this is precisely the point. Brilliant Earth’s value proposition is only truly valuable if it is 100% iron clad reliable. If a vendor can so easily make a mistake and break their exclusivity contract (I stress by mistake), then it stands to reason that they can just as easily make a mistake and break their provenance-tracking contract. If there’s a possibility of non-provenanced stones getting through, then we’re already entering into a discussion of relative probabilities as opposed to making a clear-cut moral choice. We tried to arrange a visit to some of Brilliant Earth’s vendors in India to inspect their tracking system personally. Brilliant Earth wouldn’t allow it unless we signed a Non-Disclosure Agreement first, preventing us from writing about anything we had seen. This was obviously a non-starter for us. I’m sure Brilliant Earth’s vendors make fewer mistakes than the percentage of artisanal diamonds in the market (around 15%). But is the difference enough to warrant paying the price premium that they demand? It’s really not clear to me what the answer is to that question. In the example of above of the exact same diamond, Blue Nile has it listed for $20,311 where as Brilliant Earth had it listed for $21,470. That’s a difference of over $1000 for which you’re getting in return better odds of not getting an artisanal diamond. The differences in price for smaller diamonds, by the way, are much more significant. Here is a 3/4ct H VS1 from Brilliant Earth for $2,690. A comparable diamond diamond from Blue Nile is 19% cheaper. Take a look at this superior diamond for $2,205. That is a significant difference. The other element of this claim that deserves attention is the assumption all artisanal mines are tainted with intolerable human rights abuses. This, in itself, is debatable. Yes, these artisanal mines are disorganized and unsupervised, but that doesn’t mean that they are all cesspools of exploitation. Do children work in many of them? Absolutely. But do children also work in Indian diamond polishing factories? Most definitely. Does anybody protest this fact? Of course not. Are all the workers involved in creating your smartphone treated fairly? I doubt it. But that fact doesn’t seem to bother most of us. Simply put, the fact of the modern world is that we like our products cheap. And the way this happens, if you’ll excuse the gross generalization, is that the West exploits the East. Unlike the discussion above re: Africa, where it’s possible for suppliers to make mistakes, when it comes to some Canadian diamonds, they are inscribed and tracked from mine to store. These diamonds are called CanadaMark diamonds and the rules governing their tracking are determined by the Canadian Diamonds Code of Conduct (CDCC). Therefore, in most cases, if a store is listing Canadian diamonds, you can completely rely on that claim. Curiously, though, while Brilliant Earth lists Canadian diamonds, they do not sell CanadaMark diamonds that are traced from mine to store. This was recently uncovered by Bryan Clark of The Next Web. We were interviewed for the Clark article and pointed out the fact that Blue Nile, who doesn’t use the “Beyond Conflict-Free” differentiator to sell their diamonds, use the universally verifiable CanadaMark diamonds for their Canadian Diamonds inventory, while Brilliant Earth who is all about traceability to origin, doesn’t sell the more expensive CanadaMark diamonds. 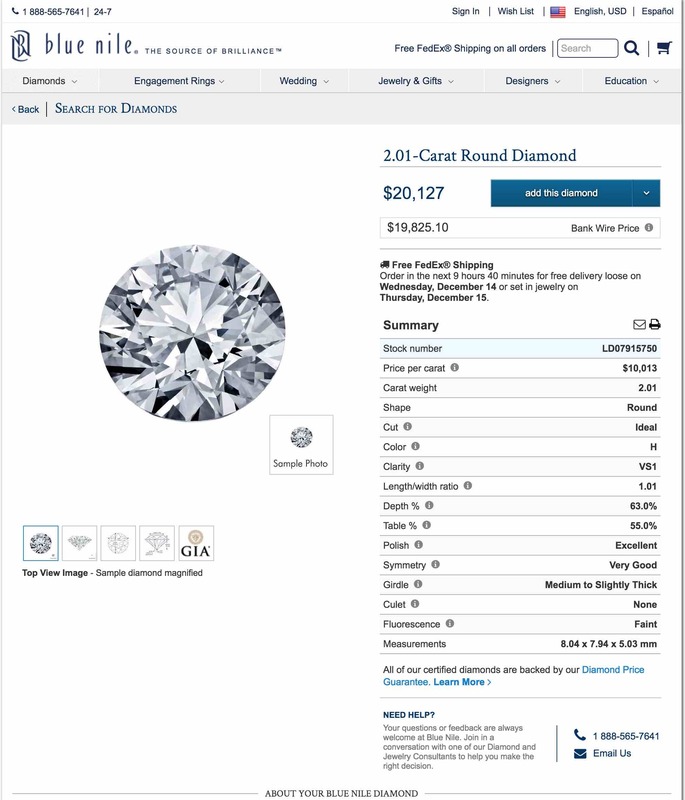 The Clark article and the YouTube video both pointed out diamonds dual-listed on Blue Nile and Brilliant Earth where the diamond is listed as Canadian on BE, but just a regular stock item on BN. Even if you could trust their suppliers 100% (which we don’t think you can based on the evidence we discussed above), are Canadian Diamonds a good choice? From an ethical standpoint, yes, Canadian diamonds are completely clean. The only issue is that by avoiding the small chances of buying a diamond that was mined in an artisanal mine which abuses its workers, you are taking money away from the legitimate mining operations (which represent the vast majority of diamonds exported from Africa) that support and enrich the local economies. Even if this shifting of resources from Africa to major mining conglomerates doesn’t concern you, the question still remains: is Brilliant Earth the best place to buy Canadian diamonds? They are more expensive than Blue Nile, even though they’re selling generic goods while Blue Nile is selling branded certified CanadaMark goods traced from Mine to Market. Here I compare a 1.05 F color SI1 Clairty “Canadian” diamond on Brilliant Earth to something I found on James Allen. While we love James Allen, we never bother recommending CanadaMark diamonds from them. That said, this 1.01 F SI1 came in at $6,480. So even comparing identical brands, Brilliant Earth is still 15% more expensive. Honestly, we don’t understand how a site dedicated to ethical consumption can sell Russian diamonds as a solution. Various Russian government bodies own 77% of ALROSA, who enjoys a 95% market share of Russian diamond production. In what sane world should someone feel good about themselves helping a dictator who just annexed a part of Ukraine and supports the biggest human rights violators around the globe? Is that supposed to make people feel better about making this purchase? This is beside the fact that, according to industry insider Chaim Even-Zohar, Russian diamonds are themselves not clean of human rights abuses. Why take money out of the African communities that rely on diamond-sourced income and feed it to a confirmed human rights abuser? I think these are great. You can’t find a better way to lower the ethical/environmental footprint of your diamond than just buying a diamond that someone else doesn’t want anymore. 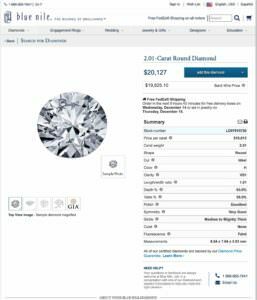 If a recycled 0.70ct I SI1 costs $2,480 on Brilliant Earth, should you not buy the same quality diamond for $1,548 on Blue Nile? 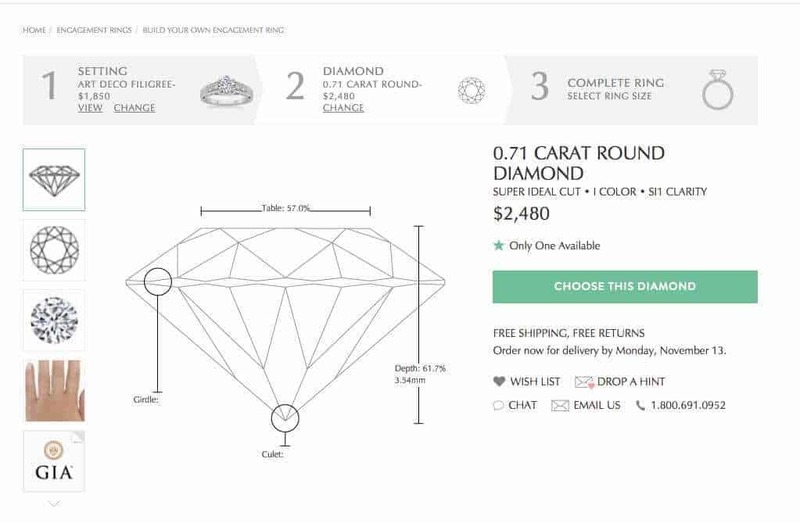 Shouldn’t recycled diamonds cost LESS than “new” diamonds? You can see in our article about Synthetic Lab Created Diamonds that we just don’t see any value in lab created diamond. Even if you were to go that route, you can easily find something similar for the same price elsewhere, like this ring. While we commend Brilliant Earth on their attempt to provide a place for the ethical consumer to buy diamonds, we feel they ultimately fall short of the mark. The Botswana Sort stones are a great idea in theory, but their complete dependence on their suppliers’ competency leaves open the possibility of mistakes. That being the case, the steep premium over regular goods at other sites like Blue Nile and James Allen are difficult to justify. Canadian diamonds can be bought elsewhere for less money. In our opinion, Russian diamonds are the farthest thing from ethical consumption. Recycled and Lab-created diamonds are great in theory, but they should be a lot less than regular goods in order to be attractive. 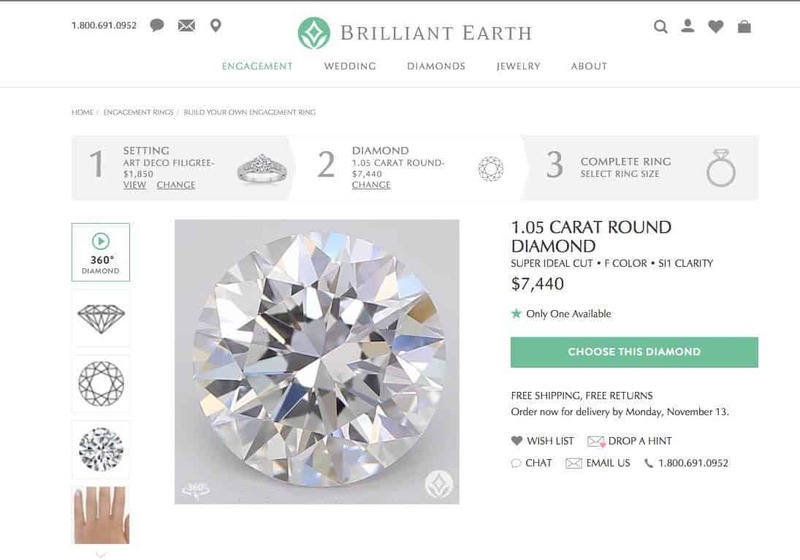 Ultimately, even if you are a customer who is interested in the 5 components of Brilliant Earth’s guarantee, you could still satisfy that list and spend 10% less at James Allen buying a Canadian diamond.